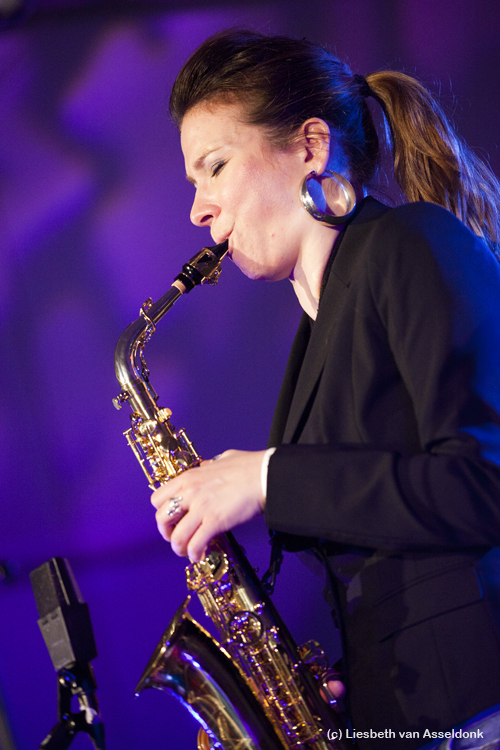 We are thrilled to announce that Susanne Alt has joined our Yanagisawa Saxophones artist roster! Saxophone: Yanagisawa A991 with NeckA95 (solid silver) Susanne Alt plays Vandoren mouthpieces. Susanne Alt is a saxophone player and composer, living in Amsterdam. So far, she has released 5 albums. Since 2006 Susanne has been using Youtube almost like a concert diary, uploading 200 videos of her live concerts. Up to now the clips have been viewed more than 500 000 times and counting.. By using social media and Youtube, Susanne created a dedicated worldwide fan community, still growing each day. Susanne has been getting even more media attention since her third album 'On Track' (2009), it featured trombone legend Fred Wesley, famous from his work with James Brown, George Clinton and Parliament Funkadelic. Her latest release is 'How to kiss' (2012), released in BeNeLux, USA, Germany, Austria, Switzerland. In autumn it will be released in France. In 2004 she became finalist of the “Dutch Jazz Competition”.Also in 2004, Susanne released her debut album “Nocturne” 2007 she founded her own label “VENUS TUNES” and released “Delight” with special guest Anton Goudsmit on guitar. 2009 she released “On Track” with special guests Bruno Speight on guitar (guitar player of Maceo Parker) and Fred Wesley on trombone. Fred Wesley invited her back for a little tour in the Netherlands and France to join his band “Fred Wesley and the new J.B.’s”. Since 2009 Susanne performed as a guest with the band of Jamal Thomas (drummer of Maceo Parker). Since 2009 Susanne performed a couple of times as a guest with P-Funk legend George Clinton and Parliament/Funkadelic. Besides playing jazz, soul and funk Susanne has always been doing a lot of freelance work in other musical genres and formations, and also can be heard on house vinyls and regularly performing with house and jazz dj’s through whole Europe. Some dj’s she works/has worked with: Erick E, Roog, Natarcia, Promiss, Martin Damen, Leonardo, Ronald Molendijk, Marc van Dale, Cassie 6, Graham B, DJ Maestro, DJ Alankara and the dj’s at Wicked Jazz Sounds. This is the fifth album of saxophone player Susanne Alt, and for the first time she recorded a few covers besides her own compositions. Previously a quartet, the band consists now of 5 musicians, including a guitarist. “How to kiss” features 3 special guests: trumpet player Loet van der Lee, percussion player Jos de Haas and hammond organist Thijs van Leer, famous from his prog rock fusion band Focus. The style changed even a bit more from modern jazz towards funky souljazz. For the first time Susanne is singing one short piece, the last tune of the album, “Just a little lovin’”. The title “How to kiss” is a hommage to all the strange ways of kissing cheeks or shaking hands, connecting to a person. In the Netherlands and in Switzerland you kiss 3 times, while in France it’s two times, but older dutch people for example prefer two kisses as well. Confusing… And it’s a hommage to the process of getting to know a new lover and the exciting atmosphere around the moments when you start kissing.